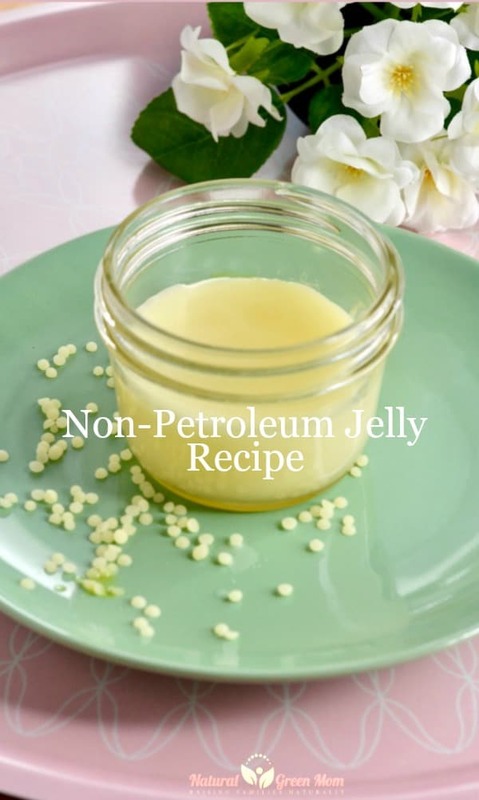 Non-Petroleum Jelly Recipe with only 2 ingredients. 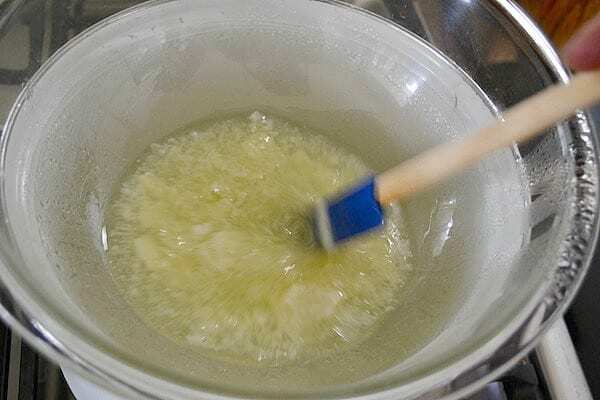 Did you know it was possible to make non-petroleum jelly? If you’re looking to use something other than Vaseline, you’ll love this easy to make recipe. Why would you want a natural alternative to Vaseline? Look at the ingredients label of a jar of Vaseline and you’ll find it is made from petroleum products like mineral oil and paraffin wax. Non-petroleum jelly is every bit as effective but uses all natural substances. 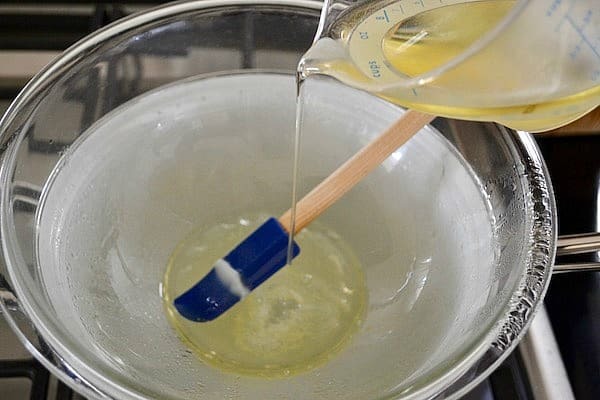 In fact, you’ll just need two ingredients: beeswax and avocado oil. I love avocado oil as the base of this recipe as it is wonderfully emollient. It works by both coating the skin and by preventing trans-epidermal water loss. It also has a light, pleasing scent. The creamy consistency of this non-petroleum jelly means it will trap more moisture than a standard over the counter lotion. This makes it highly useful for dry, chapped skin and lips. *You could substitute olive oil for the avocado oil. However, I find olive oil has a heavy scent that leaves me smelling like pizza. 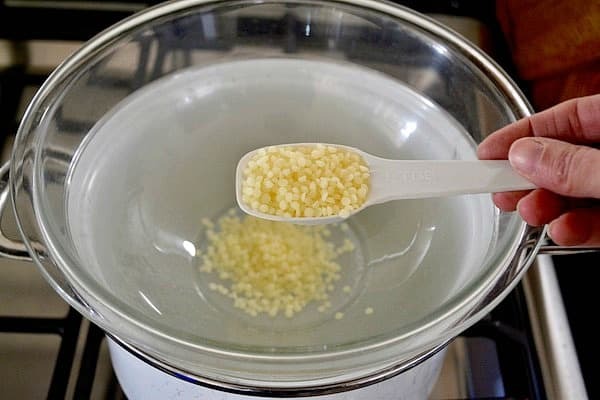 Melt beeswax pellets in the top of a double boiler. Once melted, pour in the avocado oil. The beeswax will most likely harden again. That’s okay. You’re going to continue to heat and stir until well combined. Transfer to a pint size jar and allow to cool and harden. Your non-petroleum jelly will have the perfect consistency when cooled. Be sure to label your jar with the date you made this non-petroleum jelly recipe. 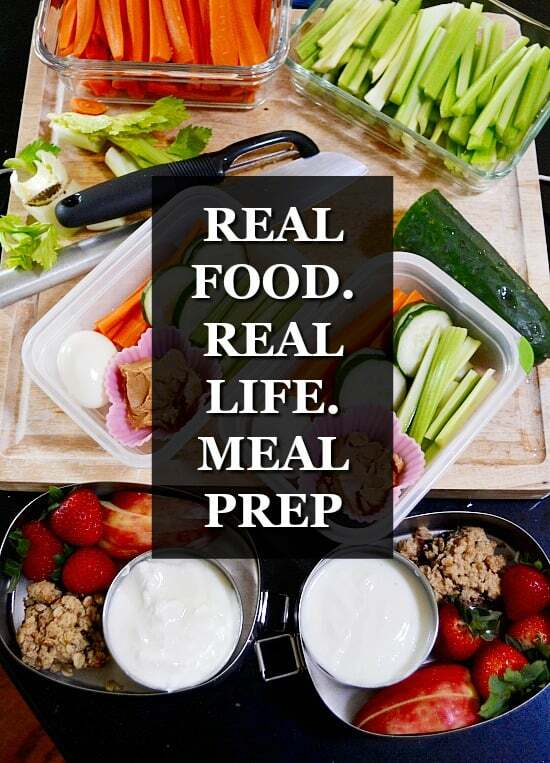 You will want to make a new batch after about 6 months. Now that you have a stash of beeswax, why not make Homemade Lip Balm? 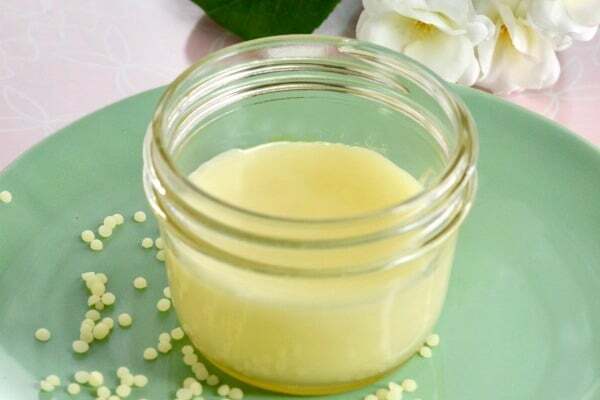 Once you have a stock of homemade non-petroleum jelly, there are so many ways to use it! Apply the jelly to chapped skin to soothe and moisturize. Use non-petroleum jelly on cracked heels to get beautiful summer feet. Try applying a bit of jelly to your heels then wearing a sock for the rest of the day. Use a small dab of non-petroleum jelly to create a “pollen trap” during allergy season. Apply a small amount under your nose when venturing outside. This will help trap the pollen before it can be inhaled. Have a cut or scrape? After it has scabbed over, dab a small amount over the cut to expedite healing. If you get a blister, you can smear a small amount over the clean and dry area to prevent further friction. Use a small amount to help remove your eye make-up. Slick your eyebrows into shape with a bit of non-petroleum jelly. Ring stuck on your finger? Use a bit of non-petroleum jelly to help it slide off.